This amazing plant isn’t really a grass, but it looks like grass. 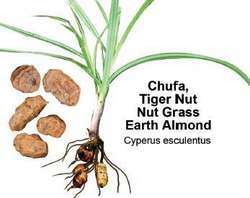 (It’s a form of sedge) What makes this plant famous is the underground edible “nuts” (actually root tubers), a food source for ancient Egyptians and Arabs, now grown everywhere from Spain to California. Slightly sweet, nutty caramel-like flavor and texture. Soak before eating to soften. Very high in healthy fats and fatty acids similar to olives! The oil is actually very similar to olive oil. More nutritious than peanuts. Great source of healthy carbs for energy and also used as milk replacement. Considered a strong aphrodisiac. High in fiber so it helps constipation. Great for stress, fertility, liver, heart, stomach, menstrual, mouth, gums, ulcers. Used for breast lumps and cancer, endometriosis, fibroids, hernia, prostate, prolapsed colon, diuretic, cholesterol, atherosclerosis, anti-inflammatory, strong anti-oxidant, improve eyesight, digestion, promotes uterine contractions during childbirth. OK for diabetics. Considered an invasive weed because it takes over yards and gardens, even if one tuber is left in ground. Stems are triangular, distinctive flowers have clusters of flat, oval golden seeds, surrounded by 4 thin “leaf” spikes, 90 degrees from each other. Do not take while pregnant because it promotes uterine contractions. It was observed that tiger nut production is predominantly the work of women farmers as high as 70% and 30% men . Tiger nut milk/beverage/drink commonly called 'kunnu aya' in northern Nigeria is a healthy drink with many nutrients. Tiger nut flour has a unique sweet taste, which is ideal for different uses. Tiger nuts, which are rich in starches, are highly abrasive in an unheated state. 5lb during a night session and when Phillip Fear baited up with tiger nuts he landed 16 carp to 12. Sip an "horchata" - a milky drink made from tiger nuts or almonds - or a cold beer in one of the "terrazas" or open-air bars and watch the world go by. Popular sweets included tiger nuts, bullseyes, and locusts. Sample cherry lips, chewing nuts, tiger nuts, coconut mushrooms, floral gems, fairy satins, Pontefract cakes, rhubarb and custard, and sour plums. How strange to think every exotic fruit was sampled by all us lucky 'Dockies' and I can still remember the milky taste of the Tiger nuts that we used to buy. Memories of the good old Bays..
As I sipped my chilled horchata, a local milky-type drink made with tiger nuts, I realised this was the perfect city - sun, sea, sand, art, culture, nightlife, modern and medieval buildings, shopping, great wine and food. Fishery rules include barbless hooks only and banned baits are: boilies, peanuts, tiger nuts, trout pellets and trout pellet paste, groundbait, bloodworm and joker. The only bait restrictions are that trout pellets and tiger nuts are banned and entry can be made by contacting the fishery on 029 20 595929.